Have you ever learned of a new-to-you word, historic event, interesting fact, or famous person only to see a reference to it again within days? In school, I loved being able to make those types of connections between classes, especially if they were in different disciplines. Now I find them all over the place. For example, I was watching Prison Break⁠1 a few weeks ago and one of the characters mentions that he stole a baseball card collection that included a Honus Wagner, not realizing it was worth hundreds of thousands of dollars. That one card bumped his crime up to grand larceny, which carries a much heavier sentence than petty theft. It happened again a few days later. I’m currently reading What It Is Like to Go to War by Karl Marlantes for research and personal interest. A few days ago in an episode of Agents of S.H.I.E.L.D.⁠3, Agent Ward was reading Marlantes’ other book, Matterhorn: A Novel of the Vietnam War. Just a week earlier, his mention would have gone right over my head. But it's “Thin red line of ‘eroes” when the drums begin to roll. Thin red line. Wait, like the movie with Jim Caviezel and every other famous actor of the day who wasn’t in Saving Private Ryan that year (1998)? Why, yes. Turns out the book by James Jones, on which the movie was based, was named for the line in the Kipling poem. I liked “Tommy,” so I started reading about the poet. As I learned more about the context in which he wrote, I found myself even more interested in his work. I put book of Kipling's work on hold at the library, and when I went to pick it up today the woman told me they’re hosting a Kipling program in a few months. I almost laughed. The connections never stop. Things I've never heard of are suddenly everywhere. Infinite Jest by David Foster Wallace popped up in both book club readings and in a friend’s Twitter feed within a three week span. 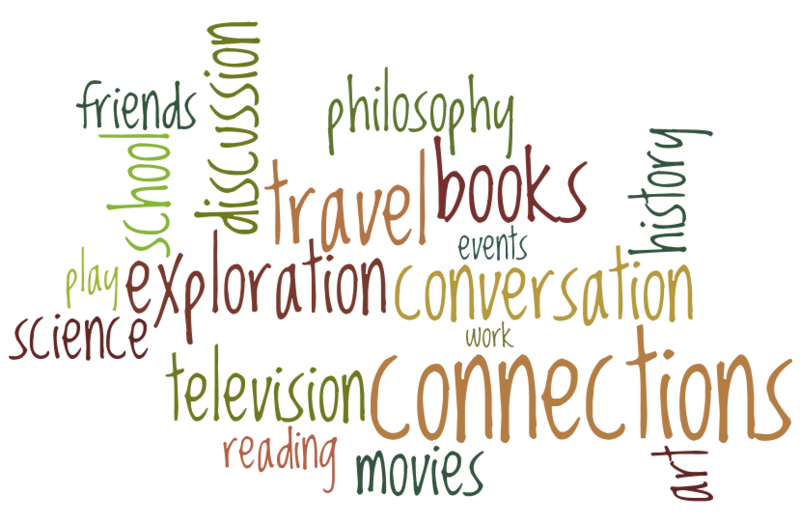 These connections enrich the experience of reading, watching, living. They’re one of the reasons I love learning and exploring so much. For me, it’s not about feeling smart, but about finding a commonality of experience in unexpected places. Have you made any interesting connections lately? This seems to happen to me also when I’m reading and/or going about daily life. There often seems elements of synchronicity to apparently disconnected actions or thoughts — or choices of literature. I too will read something and then, unbidden, a reference shows up to it later. Like your reference to Honus Wagner. I think I saw an image of the baseball card at some point in the past few weeks but I can’t remember the precise event that had me looking at said image. I’m male and American and I have just about zero knowledge of baseball or basketball. So what was I doing staring at an image of a Wagner card on the monitor? I don’t know. Another thing that seems to affect me is dreams. Sometimes I get very intense dreams and one of them turns out to be a close match with some future real life event. My accuracy rate is low, understand…but I suppose I do not forget the dreams that came out reasonably close to reality. Bob: It does sometimes feel like the universe is bringing things together. How funny that you’ve seen a Honus Wagner mention recently too. I think you make a good point about the dreams that mirror reality being memorable. I haven’t had many of those, but I’ve had some that were so vivid I still remember bits of them years later, even from childhood. Weird, because most days I don’t remember them more than thirty seconds after I wake up. 😉 Thanks for stopping by! I love these synchronicities, too, and following them is like being led on a treasure hunt. It does make life more delicious, and provide wonderful pathways to explore as a writer. I often wonder about oral traditions that people make connections to. Let me try to explain that. Someone I knew slightly at my day job seemed a bit out of place there. She would use expressions that came from her farming background. She grew up on a farm. She used the language of her parents. Many of her conversations and actions reflected her years on the farm (no insult to her, I assure you.) Many of these phrases seemed to have originated from her parents and farm neighbors. Where did they get their mindset and verbal expressions from? Their own parents and neighbors of their time, I think. There must be a set of responses and way of thinking that is cast in the shadows of the past, and is an oral tradition, and people connect to that. I think everyone falls back on such an oral tradition that reflects their family, community, and cultural backgrounds. Perhaps a phrase that I use today was really originated by a forgotten ancestor. Since you quote Kipling, I quickly looked up his background on Wikipedia. Thank you for quoting those “thin red lines” — I should read Kipling. I had imagined that many of the successful “classic” writers such as Coleridge and Kipling were fairly well to do. Coleridge was not, his family was fairly humble, but Kipling was more well to do. Both these writers must have recorded to some extent…perhaps without realizing it…the oral traditions of there time. Now let me do a fast forward. Does anyone remember the “Foxfire Books”? Edited by oral historian Eliot Wigginton? I used to have every one of the books which recorded an oral history of Appalachian residents. The students who interviewed those residents and recorded their words and photographed their techniques at whatever it is have given us a priceless treasure. Perhaps in our daily lives, we connect back to our long-forgotten ancestors and roots in what we think and say. Perhaps that was one of the reasons I so liked Old Sturbridge Village. Bob: Very interesting. I agree that Kipling and others provide insight into their time period, in speech, mores, and political context. Some of his work doesn’t paint him in a very flattering light with regard to the locals he worked with in India (though I was kind of hoping “White Man’s Burden” was satire), but it does reflect the attitudes of the time, and there’s something to be gleaned from that. I love noticing the differences in language across the U.S. Despite the globalization of speech through social and regular media, some areas still have vastly different speech patterns. It’s entered common usage now, but when I moved to northern California for my senior year of high school, that was my first encounter with the word “hella” or “helluv” to mean “very.” As in: “That Ferrari is hella cool!” When I moved to San Diego for college, you could tell who was from the Bay Area because they were the ones using “hella.” I had picked it up while there, but lost it within my first year of college. I’m not familiar with the Foxfire books, but I think anything that captures the essence of the language and customs from a subculture in a specific time period has immense value. Many will likely be lost eventually. I like your idea of connecting to a community through language and action. There’s a vague, nearly indefinable feeling I get about the places I live and whether or not I “fit” there. That is, could I settle there, or are we just visitors for a few years? Having been raised by parents who were both from Arizona, having spent a good chunk of my youth in AZ, CA, and UT, and having married an Arizona boy, I relate best to the western U.S. I can enjoy other places–and have, immensely–but when I have to choose, I can’t see myself living anywhere except CA, OR, or WA (I need ocean and mountains). The past still has bearing on the present, on the mindset and culture of a place, even in very diverse places like northern Virginia (the one area back east that I have felt most comfortable, probably *because* of its diversity.) I can’t quite put my finger on it, but it’s there. Anyway, enough of me rambling. 🙂 Thanks! I too wonder if I fit in to my community. My present one, yes. At least I’ve lived here for a long time. Utah seemed interesting — but only because I dreamed of bicycling over the mountains. Could I fit there? I don’t know. And now to go off on a sudden tangent. When I think about this very interesting thread, I ask myself: what things do I say now, what behaviors do I show now, which could connect me to an ancestor of mine, in the time of Kipling? I don’t know that, either. Written records of birth, schooling, marriage, and death usually tell nothing of a person’s life and mannerisms and interests and activities. Bob: I’ve had a similar thought about my family tree. It’s fairly complete for quite a few generations back, but I have very little sense of who they were in any meaningful way. A few times in my life I’ve thought about or was humming a specific song, when I would overhear someone else start singing the melody to themselves… or the song would start playing on the radio. I was working on a short story, put it aside for awhile to work on other projects, when later I saw the movie “Cloud Atlas”– about characters living several different lives during several different periods of time. This was the premise for my own story– which I’ll still finish one of these days. Have a great holiday, Gwen. loujenhaxmyor: Funny how that works isn’t it? My friend and I often end up writing stories with similar themes, even though the books themselves are very different. It’s happened several times now. Good luck getting your story finished!